This SQL exercise is a part of a section dedicated for data analysts , providing data analysis tasks that require both business understanding and technical skills. Stack Exchange Is a network of sites, allowing different communities learn and share their knowledge. Movies & TV Stack Exchange – is one of these sites, focused entirely on questions and answers regarding movies and series. 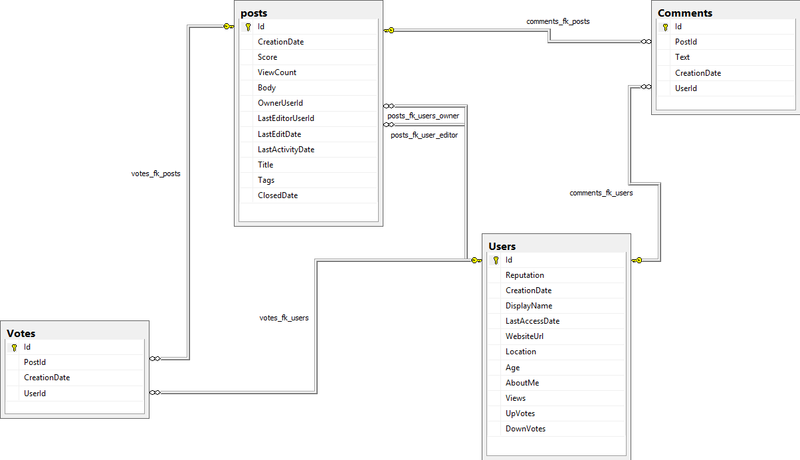 The following database is built according to its structure, and simulates some of the data it has. The following exercises are constructed in ascending difficulty order. First ones are pretty easy, made for warm-up. The advanced exercises, on the other hand, can be quite challenging. How many post were made each year ? How many votes were made in each day of the week (Sunday, Monday, Tuesday, etc.) ? How many users have never voted ? Whats the most common post tag ? -- 2. How many votes were made in each day of the week (Sunday, Monday, Tuesday, etc.) ? -- 3. How many users have never voted ? -- 5. For each post, how many votes are coming from users living in Canada ? -- 7. Whats the most common post tag ? --     Note, each post may have 1 or more tags.